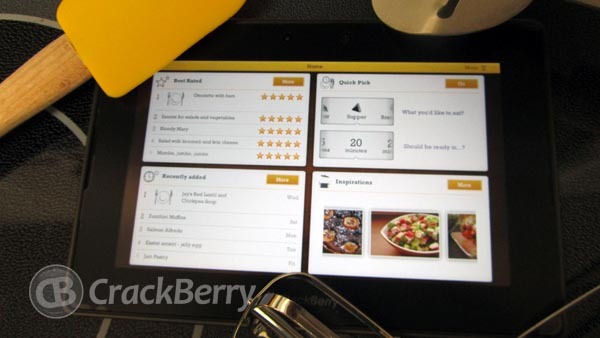 Cooklet for the BlackBerry PlayBook gets a sizzling new update! We first showed you Cooklet a while back after its big win in the AppCircus at BlackBerry Jam in Orlando. Since then, Cooklet has been downloaded more than 600,000 times and now I can see why. I’m new to the kitchen and already Cooklet has given me some fantastic, crowd pleasing recipes and solved my “What’s for dinner” woes. The exclusive BlackBerry PlayBook version has gotten a hot new update with a complete redesign that makes the app a bit more user friendly. Cooklet 6.2.7 is now available in BlackBerry App World for only $1.99. This is a limited time offer so be sure to check out Ryan’s review here and the update notes below, then head on over to App World and grab your copy today! Cooklet is more than just a cookbook and pictures of tasty looking food. It’s a great source for inspiration on what to cook, helpful tips and allows you to socialize and interact with others who share your passion for food as well as new cooking techniques and recipes. You can find Cooklet on sale now at BlackBerry App World for the low price of $1.99 (regular price is $4.99) on PlayBooks running OS 1.0.3 or higher. Those of you who may have previously downloaded the FREE version can upgrade for the same low price of $1.99. If you love to cook and need some new recipes to try out, Cooklet is a must try and at $1.99, it’s definitely a chef’s dream come true.